The LPS100-M AC-DC medical power supplies feature both ITE and non-patient contact and non-patient critical medical safety approvals. The series has a compact open-frame design; measuring just 2 x 4 inches, with a height of only 1.29 inches, and has a typical full load efficiency of 88 percent and a power density in excess of 14 watts per cubic inch. The supply is primarily intended for use in information technology equipment (ITE) and light industrial systems, as well as for equipment intended for non-patient contact and non-patient critical use in low power medical, dental and laboratory applications. 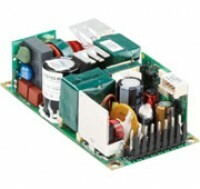 The LPS109-M has POE (Power over Ethernet) isolation on the main output.